The first ever 2014 Audi A8 L TDI® quattro® all-wheel drive with the new 240 horsepower 3.0 liter TDI clean diesel engine starts at $83,395 (including $895 destination charge) with an EPA estimated fuel efficiency of 24 city/ 36 highway/ 28 combined mpg. 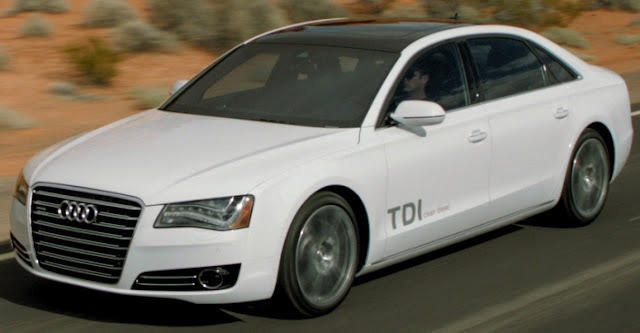 The 2014 Audi A8 L TDI with 0-60 MPH time of 6.4 seconds will go on sale in early this Spring. The available Premium Package now consists of Audi side assist and pre sense rear, 22-way multi-contour comfort seats, front seat ventilation with massage and full LED headlights. The A8 L TDI, available in the long-wheelbase version only, joins the other A8 models: A8 3.0T, A8 4.0T, S8 4.0T and A8 W12. In comparison, the 2013 A8 L 3.0 TFSI® twin-turbo V8 gas engine model sells for $79,395, $4,000 less than the new TDI but it only gets 18/28 mpg vs. the 2014 A8 L TDI at 24/36 mpg. So let's say you drive 12,000 highway miles per year. With the gas engine at 28mpg using premium grade at $4.06 per gallon its costs $1,740 per year. With the TDI at 36mpg using diesel at $4.26 per gallon it costs $1,420 per year, a fuel cost saving of $320 per year. The TDI costs $4,000 more so it will take 12.5 years ($4,000/$320) to breakeven. Other TDI considerations like less maintenance cost and cleaner emissions have not been factored in. Where do babies come from? 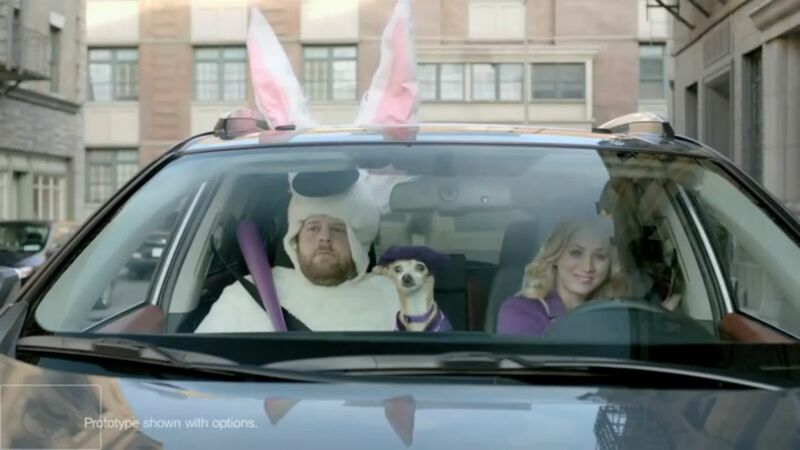 Kia's Super Bowl Commercial, "Space Babies" deals with a Dad's answer as the family rides in a 2014 Sorento. He explains they parachute in from a planet called Babylandia. 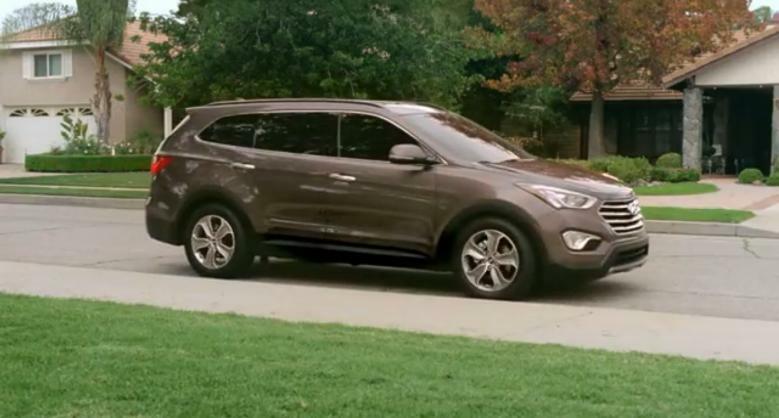 “Don’t Tell” is Hyundai's 30-second Super Bowl pre-game show spot featuring the all-new 7-passenger Santa Fe. “Excited” is Hyundai's 30-second Super Bowl pre-game show spot featuring the 429 horsepower, 8-speed Genesis R-Spec racing around a track voiced by sportscaster, Gus Johnson. “Epic PlayDate” is Hyundai’s 60-second pre-kick off commercial featuring the all-new seven-passenger Santa Fe with a soundtrack, Sun Blows Up Today, written for Hyundai by The Flaming Lips rock band. "Team" Hyundai's other spot featuring the all-new 7-passenger Santa Fe and airing in the first quarter was released earlier. 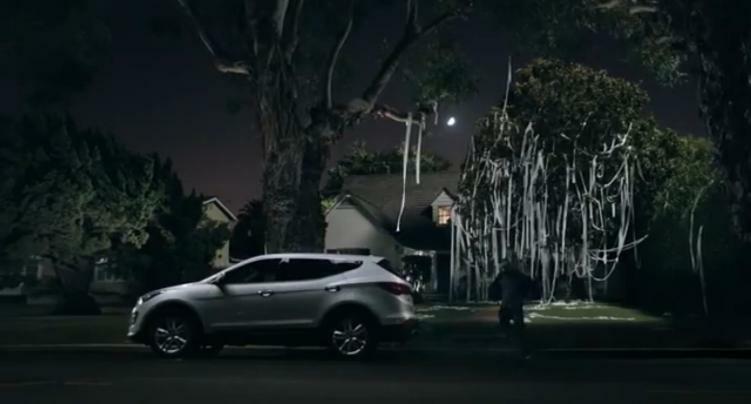 “Stuck” is Hyundai's 30-second second quarter Super Bowl spot featuring the Sonata Turbo. The clear message is that when you're stuck behind a vehicle you need to pass, the turbo gives you the power. CANADA SUPER BOWL COMMERCIAL: "Gaspocalypse" features the Sonata Hybrid and offers an "alternate ending". Mazda and Fiat first announced a joint venture last May, then a few weeks ago the signing of the final agreement which will see Mazda produce an open-top two-seater sports car for Fiat's Alfa Romeo brand based on the architecture of the next generation Mazda MX-5 to be built at Mazda's Hiroshima, Japan, plant starting from 2015. But what just surfaced is this photo in news release from an Illinois Mazda dealer. Though a joint effort, Mazda and Fiat will develop two distinctly styled, brand-specific roadsters featuring rear-wheel drive powered by specific proprietary engines unique to each brand. According to the agreement announcement, Mazda aims to enhance development and production efficiency and revitalize enthusiasm for open-top two-seater sports cars around the world while allowing Fiat to deliver a modern interpretation of the classic Alfa Romeo roadster utilizing the latest technical solutions, helping Alfa Romeo to achieve its stated goals by 2016. Hyundai's 30-second in-game Super Bowl commercial running in the first quarter is called "Team" featuring the all-new seven-passenger Santa Fe where a young boy and his mom gather a team of kids from various locations to fill the seven seats..
Hyundai is launching a mobile social experience that serves as a digital companion to "Team" called "Find Your 7" allowing you to assemble your Super Bowl dream team online, assigning some of your best Facebook friends to each seat in a virtual Santa Fe. Each seat corresponds to a unique character archetype, mimicking groups of friends in the real world. By participating, you will be entered into a drawing to win seven tickets to the 2014 Super Bowl. Starting today, visit FindYour7.com and login with Facebook profile to the "Find Your 7" program. If you're confused, the traditional 5-passenger Santa Fe is now called the Santa Fe Sport. 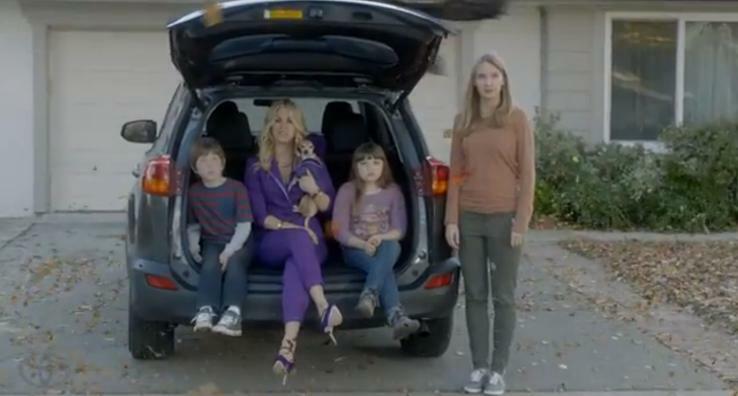 The all-new RAV4, Toyota's new "Wish Granted" commercial starring Kaley Cuoco has more car in it than the teaser spot. "Wish Granted," created by Saatchi & Saatchi LA, will run during the first quarter of Sunday's game, followed by the Toyota Super Bowl Today Post-Game Show which will also include the airing of two additional new commercials highlighting the Tundra Endeavour tow and the recently-launched company direction, "Let's Go Places." The Volkswagen Beetle Turbo is the star of the Super Bowl commercial just released by Volkswagen. With Jimmy Cliff's Jamaican reggae warm-up spot, this ad continues that "irie mon" feeling of don't worry, be happy by being tagged the "Get Happy" spot. It has stirred some chat about white men speaking with a Jamaican accent but that's what marketing is all about. It's a positive anchor, tying Montego Bay and Negril Beach to a fun car. The commercial airs in the second quarter of the Big Game. The Lincoln Motor Company, as it's now called, will, for the first time in the brand’s history, advertise in the Super Bowl. Lincoln asked comedian Jimmy Fallon to lead the first-ever Super Bowl commercial written entirely by social media, with thousands of consumers through Twitter giving their best 140 character thoughts for a script. Fallon chose the best five contributions to create the ad that will run during the third quarter of the broadcast. All-time NFL rushing leader and three-time Super Bowl champion Emmitt Smith has signed on as a brand ambassador to help Lincoln continue to put MKZ in the spotlight at the game in New Orleans. 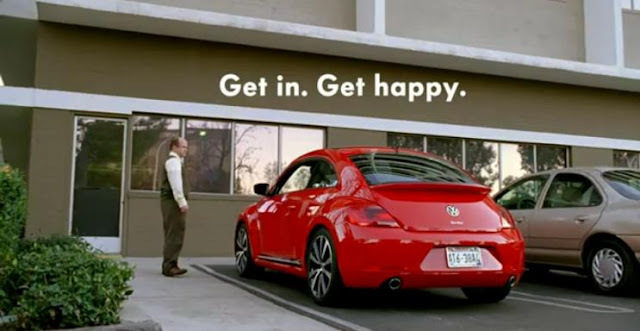 Volkswagen's pre-game video release "Sunny Side" features reggae legend Jimmy Cliff singing The Partridge Family theme song "C'mon, Get Happy". No cars just freak-outs, meltdowns, and temper tantrums leading into happy faces from all walks of life with the tag - It's time to get happy. 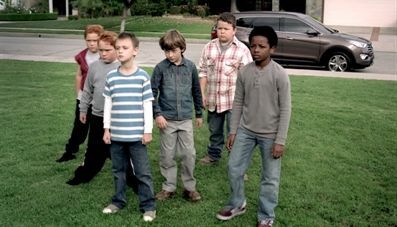 Watch the game day commercial. 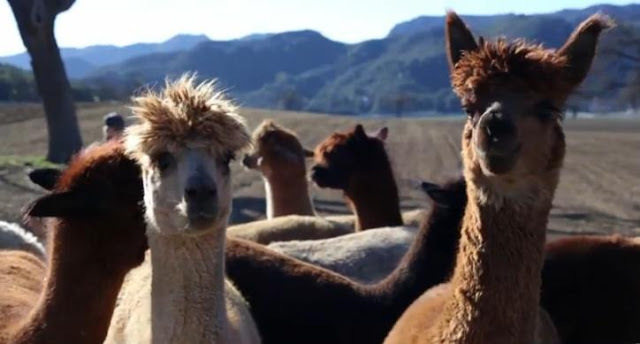 Toyota's Super Bowl Spot - Kaley Cuoco or Rav4? Toyota is hoping that 27 year old actress Kaley Cuoco gives them a big bang during the Super Bowl. Cuoco who stars in Toyota's Super Bowl game day spot is known for her roles as Penny on The Big Bang Theory, Bridget Hennessy on 8 Simple Rules and as Billie Jenkins on Charmed. 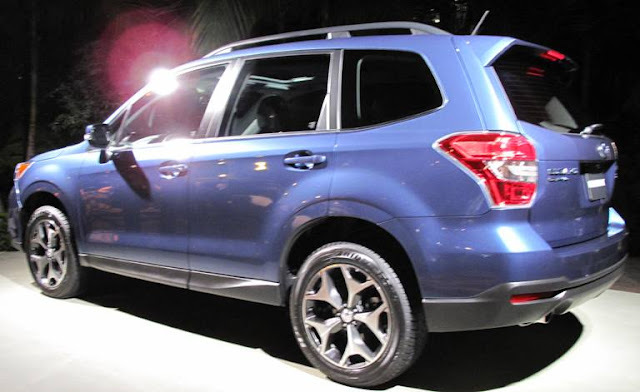 The end of the ad has her in the all-new 2013 Rav4 that was introduced at the Los Angeles Auto Show two months ago. Toyota is calling the ad the Toyota Game Day Teaser "I Wish" Starring Kaley Cuoco. She's OK but I'm hoping for a little more car. Kia returns as a Super Bowl advertiser for the fourth straight time to show off the new 2014 Sorento that rides on an all-new platform and suspension system, and offers a new V6 engine and more passenger room as well as a new top-of-the-line trim level called the SX Limited. The 2014 Sorento will be the first Kia vehicle to offer the next generation voice-activated telematics system, UVO eServices. 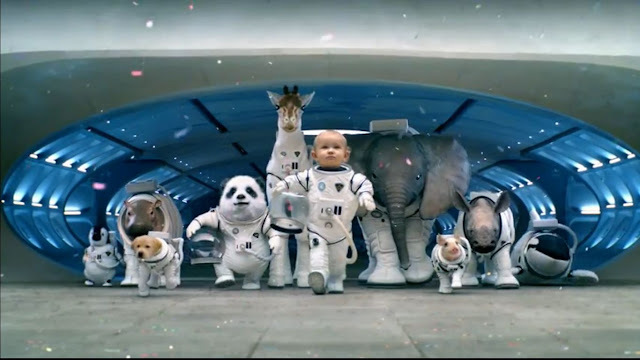 Kia's TV ad, "Space Babies" is scheduled to air in the fourth quarter of next Sundat's Super Bowl. Starting this Friday the ad will be seen on more than 33,000 screens nationwide as part of ScreenVision and National CineMedia’s FirstLook. 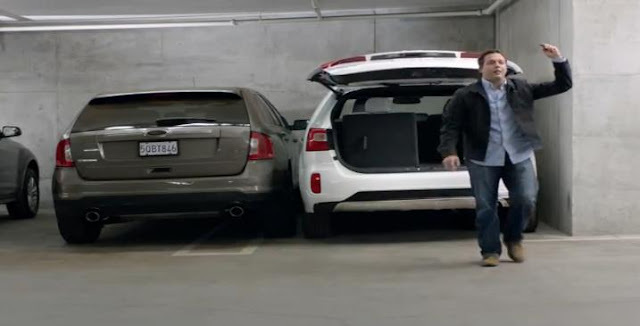 In the first spot of the Sorento’s “It has an answer for everything™” campaign, titled “Tight Space,” the father utilizes the power-folding mirrors to park in a tight space and then uses the power liftgate to exit the vehicle which impresses his wife and kids. Click on the link above to see this ad. 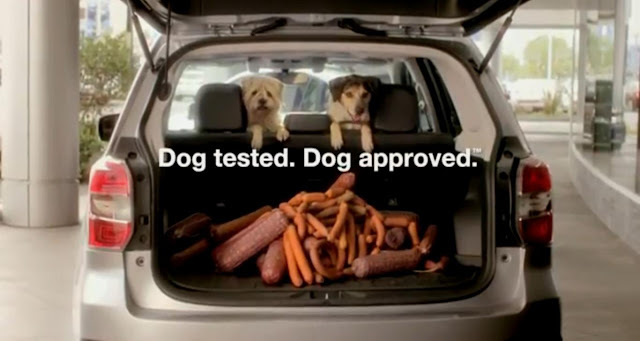 Dog Matchmaker: With the help of Grant Weber, every dog can find their perfect Subaru. Enter the dogs breed, weight, and lifestyle and the Matchmaker will identify a fitting model for the dog. This is Hyundai's sixth consecutive year as a Super Bowl advertiser and this year has five game-day ads, including four all-new spots. Two of the new ads are slotted for the pre-game show and two are scheduled to air in-game with the all-new Santa Fe featured in three of the five Super Bowl advertisements. Sonata Turbo and 429-horsepower, 8-speed Genesis R-Spec are featured in the other two spots. The seven passenger, three row Santa Fe with a 290 horsepower 3.3-liter GDI V6 engine debuted at the Los Angeles Auto Show two months ago and will hit showrooms soon..
Audi is letting you select the Super Bowl spot, featuring all-new 2013 Audi S6. 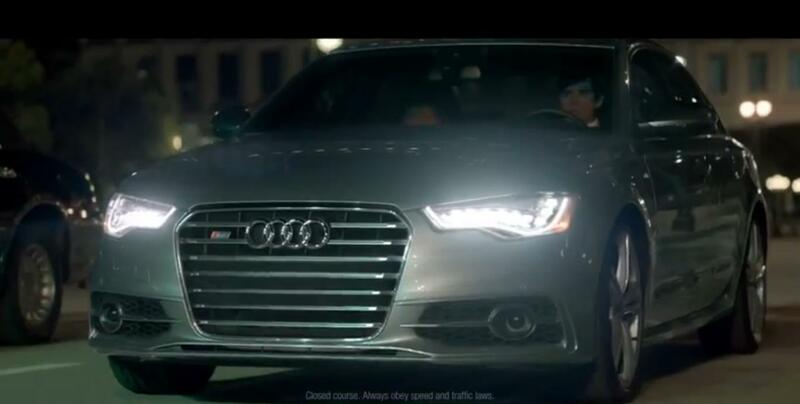 Audi has posted three versions of its Super Bowl spot, each with a different ending, to its YouTube page allowing viewers to choose how they want the spot to end. The final spot will debut on YouTube in advance of the game and on CBS during Super Bowl XLVII in the first break after kickoff. Voting on YouTube will be open for 24 hours, and has started - closing at 11:59 p.m. Eastern Time tonight - Friday, January 25. BMW and Toyota signed agreements aimed at long-term collaboration of a fuel cell system, joint development of architecture and components for a sports vehicle, and joint research and development of lightweight technologies. The fuel-cell vehicle system includes a fuel cell stack and system, hydrogen tank, motor and battery, aiming for completion in 2020. BMW and Toyota will collaborate on codes and standards for the hydrogen infrastructure, necessary for the distribution to get the public to buy into it. A mid-size sports vehicle feasibility study to define a joint platform concept, including the development of lightweight technologies, is to be completed by the end of this year. The joint effort will research the development of a lithium-air battery with energy density greatly exceeding that of current lithium-ion batteries. 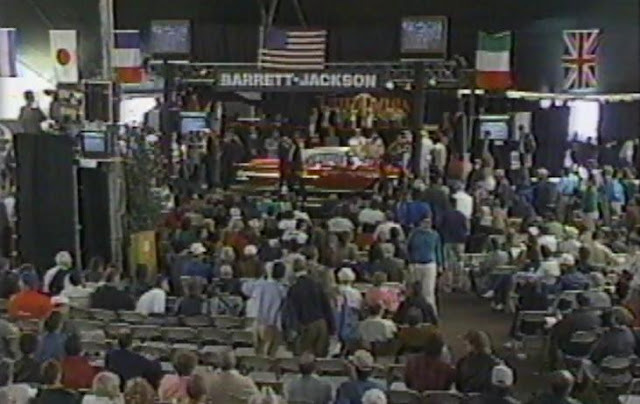 The first live telecast of the Barrett-Jackson Collector Car Auction in Scottsdale, Arizona, was on Financial News Network in January 1990, 23 years ago. 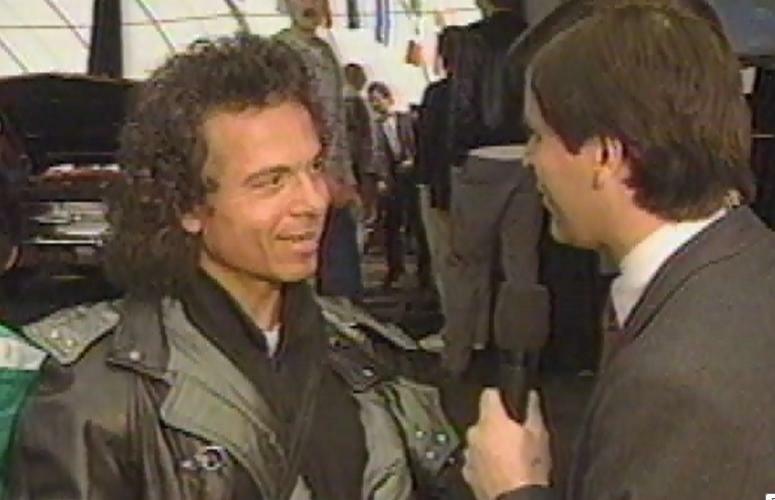 It was said to be the highest rated program in the history of FNN which, at the time was in 35 million cabled homes, and, in 1991, was acquired by CNBC. It was certainly a memorable event for me, seeing cars sell for so much, but nowhere near the prices that are fetched today. There were many notable bidders and collectors that I interviewed during that 3-hour telecast including former Seattle Seahawks owner and Blackhawk real estate developer Ken Behring, L.A. Times Publisher Otis Chandler, former New Yankee Reggie Jackson and cartoon voice Noel Blanc (below), son of Mel Blanc, famous for voicing Bugs Bunny and other Looney Tunes characters. 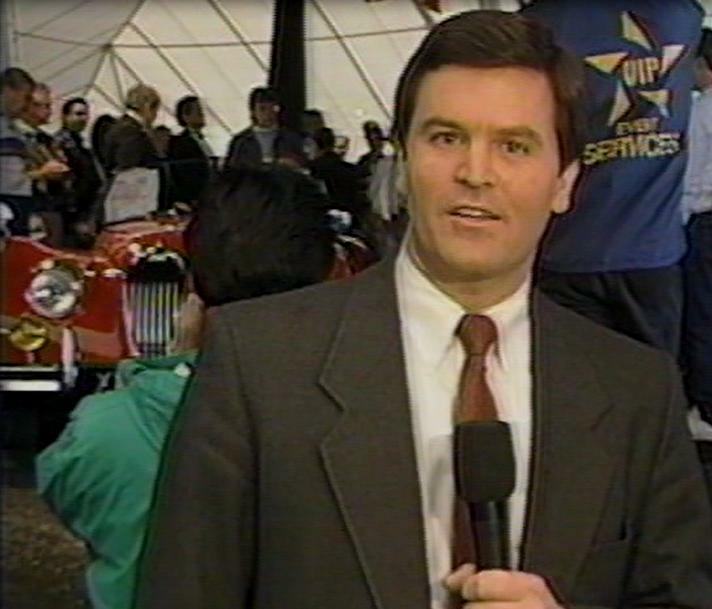 Later that year, on Labor Day weekend 1990 in Auburn, Indiana, I had the opportunity to broadcast the Auburn Cord Duesenberg collector car auction on FNN. Speedvision which started in 1996 and later became Speed, now telecasts the Barrett-Jackson auctions, including this past week when the 1966 Batmobile sold for $4.6 million. 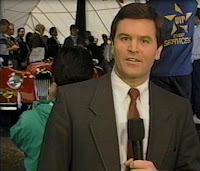 Looking back, not only brings back memories, but shows how time and inflation raises prices, enthusiasm and following. The Audi RS 7 Sportback five-door coupe uses a 560 horsepower 4.0 TFSI twin-turbo V8 engine with a cylinder on demand system that at low to medium loads and engine speeds, deactivates cylinders 2, 3, 5 and 8 by closing their valves via electromechanical actuators. The 4.0 TFSI then runs as a four-cylinder engine until the driver puts more metal to the pedal and accelerates. The engine is mated to an eight-speed tiptronic transmission which also contributes to the RS 7 achieving 24 mpg from a powerful quattro permanent all-wheel drive powertrain. The Audi RS 7 Sportback is top of the line, dishing out even more power than the all-new Audi S7 which at 420 horsepower has a starting price of $79,695. The MINI John Cooper Works Paceman is an ALL4 all-wheel drive MINI with a 208 horsepower 1.6 liter turbocharged engine making it the 7th John Cooper Works model in the line-up which will sell for $36,200 (including $700 destination charge) when it hits showrooms in March. The MINI John Cooper Works Paceman with a twin-scroll turbocharger with direct injection and variable valve control based on the BMW Group’s VALVETRONIC technology, posts average fuel consumption in preliminary EPA estimates of 31 mpg highway / 25 mpg city / 27 mpg combined for the manual transmission (30 mpg highway / 23 mpg city / 26 mpg combined for automatic transmission). 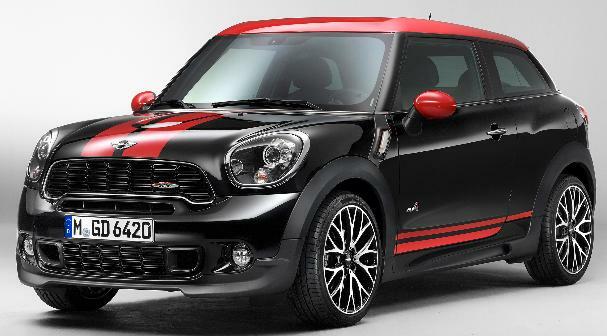 The menu of MINIs is growing and the U.S. model of this Paceman has a top speed of 127 mph. The 2014 Cadillac ELR touring coupe with a luxury 2+2 passenger layout has a lithium-ion battery system and an electric drive unit packaging a pair of electric motors and a multi-mode transaxle with continuously variable capability. The front-wheel-drive, two-door coupe extended-range electric vehicle has a large electric drive motor that propels the vehicle while a smaller, second electric motor serves as a generator to keep the battery pack at its minimum charge level and assists the drive motor with propulsion, based on performance, speed and efficiency requirements. When power from the advanced lithium-ion storage battery pack is depleted, the range-extending gas-powered electric generator kicks in to deliver continued power for the electric drive system, extending the ELR’s range, while also ensuring the vehicle’s dynamic performance. The vehicle can be completely recharged in about 4.5 hours using a 240V outlet and 12 hours with 120V, depending on the outside temperature. There are four driver-selectable modes: Sport, Tour, Mountain, and Hold which allows owners to use its gas-powered electric generator, reserving the remaining battery charge for later use for more efficient city travel. Combined electric/extended driving range is more than 300 miles, according to Cadillac. The ELR has an 8 year / 100,000 mile warranty. 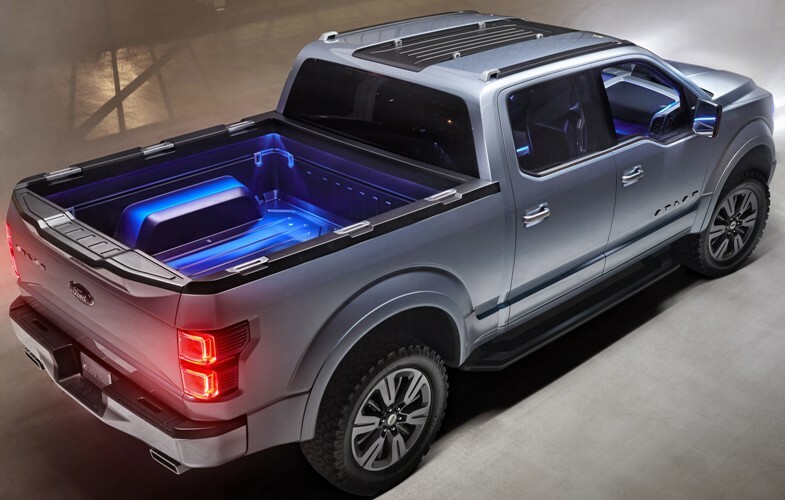 The Ford Atlas Concept pickup truck features a next-generation EcoBoost® powertrain which uses gasoline direct injection and turbocharging to deliver fuel-economy gains of up to 20 percent and reduction of CO2 emissions of up to 15 percent, compared with larger-displacement engines. More than 500,000 EcoBoost engines have been sold globally, including 250,000 in the Ford F-150. 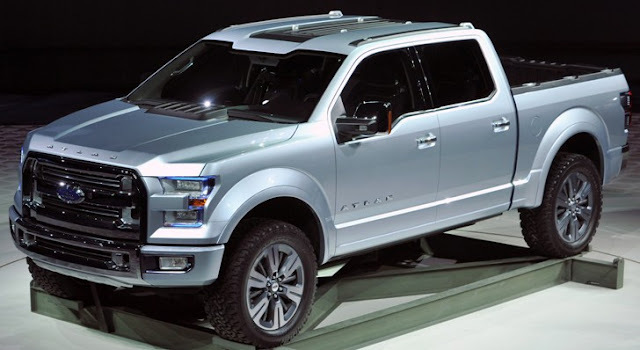 Speaking of the F-150, pickup trucks are vitally important to Ford as the F-Series was America’s best-selling pickup for the 36th straight year and 31 consecutive years as America’s best-selling vehicle. Overall, Ford sold 645,316 F-Series in 2012, a 10 percent increase versus 2011. The Atlas Concept has multiple tie-down points integrated into the cargo box walls and load floor, along with 110-volt electrical outlets in the cargo box to charge power tools. An integrated roof carrying system and hidden extendable ramps give the truck functionality for a variety of jobs. Ford Atlas Concept has such features as power running boards to help passengers enter the truck, dual-purpose tailgate step and cargo cradle for extra-long cargo items, dynamic hitch assist helps precisely line up the truck’s hitch with the trailer coupling by showing visual cues in the truck’s center display screen, and 360-degree point-of-view camera for a bird’s-eye view of the truck to help position the vehicle in tight places. The all-new 2014 Acura RLX flagship sedan with an all-new 310-horspower 3.5 liter direct-injected SOHC i-VTEC V-6 engine and Precision All-Wheel Steer™ arrives at Acura dealerships on March 15th, starting at $49,345 (MSRP including the $895 destination charge) and running up to $61,345 for the RLX with the Advance Package. The 2014 Acura RLX will be available in five grades RLX, the RLX with Navigation ($51,845), the feature-packed RLX with Technology package ($55,345), the RLX with Krell Audio package ($57,845), and the top-of-the-line RLX with Advance package ($61,345). No pricing yet on the 370 horsepower RLX Sport Hybrid Super Handling All-Wheel Drive® with expected EPA fuel-economy ratings of 30 city/30 highway/30 combined, coming later in the year. L.A. Auto Show interview with Jeff Conrad - VP, Acura Sales at American Honda. 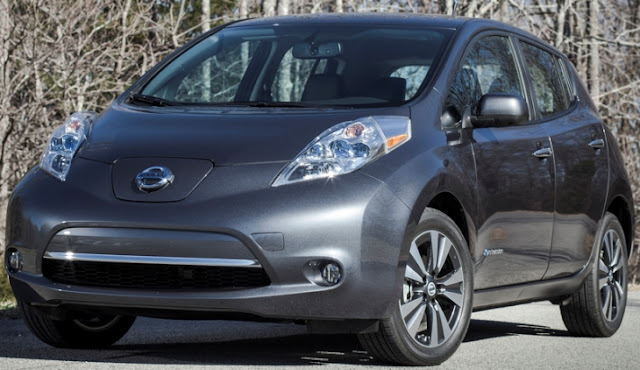 The new all-electric 2013 Nissan LEAF, its third model year, will start at an MSRP of $28,800 for the newly-added LEAF S grade, a less expensive version than the LEAF SV offered at $31,820 and the LEAF SL at $34,840. The LEAF S is the lowest priced five-passenger electric vehicle sold in the United States. Eligible Californians can purchase a 2013 Nissan LEAF for as low as $18,800 after the $7,500 federal tax credit and $2,500 state rebate. Nissan still has a lease offer as low as $199 per month for 36 months, which includes tax credits and destination charges. The 2013 LEAF has 17-inch alloy wheels and leather appointed interior on SL models, available Around View® Monitor and 7-speaker Bose® energy efficient audio system and a 6.6 kW onboard charger that significantly reduces 220V charging times and is standard on SV and SL models. Nearly 50,000 LEAFs have been sold worldwide and now LEAF production is getting a boost as manufacturing recently starting in Smyrna, Tennessee, so the new lower priced LEAF S could launch sales to new heights, which Nissan is counting on. 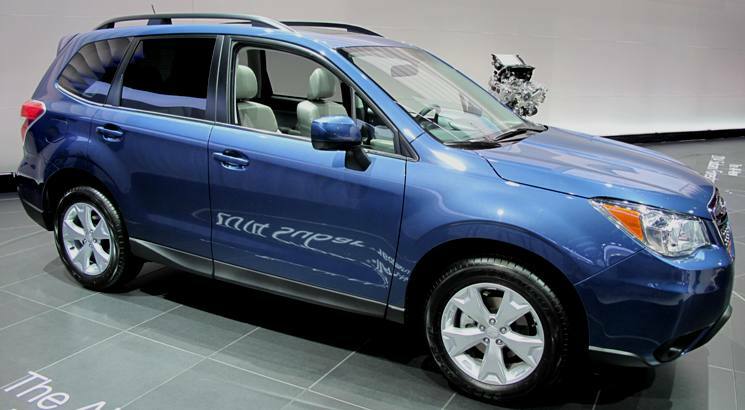 The all-new 2014 Subaru Forester 2.5i model, with Subaru Symmetrical All-Wheel Drive, will be available in base, Premium, Limited and top-line Touring versions starting at $22,820 (including the $825 destination charge) for the base model 2.5i with a six-speed manual transmission. The turbocharged Forester 2.0XT will be offered in the Premium and Touring versions, with the Premium trim offered at $28,820. Manufacturer's fuel economy estimates are 24 mpg city / 32 mpg highway / 27 mpg combined. The all-new 2014 Kia Cadenza premium sedan moves Kia up-market with premium standard and optional equipment, including Advanced Smart Cruise Control, Blind Spot Detection and Lane-Departure Warning System. The Cadenza is equipped with Kia’s all-aluminum 293 horsepower 3.3-liter V6 engine with gasoline direct injection mated to a six-speed automatic transmission that includes a Sportmatic manual shift mode and paddle shifters around the leather and wood-wrapped steering wheel. The Cadenza is expected to arrive in Kia showrooms in the second quarter with pricing to be announced closer to the on-sale date. The Hyundai HCD-14 Genesis concept has the 5.0-liter Tau® V8 engine with direct injection and Dual Continuously Variable Valve Timing (D-CVVT) mated to the 8-speed automatic transmission controlled by paddle shifters. The latest technology demonstrates driver eye-tracking and 3-D hand-gesture recognition. 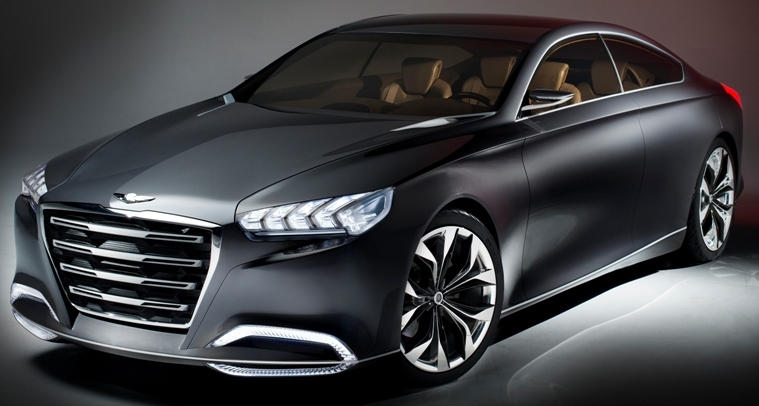 The HCD-14 Genesis is able to recognize driver commands free from the distractions associated with manual controls. Once a specific feature is selected via eye-tracking, thumb controls or gesture recognition can be used to select navigation, infotainment, audio, HVAC, and even smartphone connectivity functions. The Toyota Corolla Furia Concept compact sedan hints at the styling cues for the next-generation Corolla with an overall length of 181.9 inches. 2013 marks the 45th anniversary of Corolla in the U.S., with more than nine million sold since 1968. The 2014 Nissan Versa Note is the second generation of the Versa hatchback with a 109 horsepower 1.6-liter HR16DE 4-cylinder engine and scheduled to go on sale at Nissan dealers nationwide this summer at a starting MSRP of $13,990. The Versa Note features Around View® Monitor, NissanConnectSM with Navigation System with Hands-Free Text Messaging Assistant and Active Grille Shutter – which helps it deliver expected 40 miles per gallon highway fuel economy with the CVT transmission. The all-wheel drive Resonance concept features a hybrid electric drivetrain that includes Nissan's proprietary "one-motor, two-clutch" system, which combines a smaller displacement internal combustion gasoline engine with an electric motor/lithium-ion battery and advanced management system. The Volkswagen CrossBlue SUV concept plug-in hybrid has a 305 horsepower powertrain mates a TDI® Clean Diesel engine with two electric motors, a DSG® dual-clutch automatic transmission, and an electric all-wheel-drive system. Volkswagen’s manufacturer estimated fuel economy rating is 89 mpge combined in electric mode and 35 mpg as a hybrid. 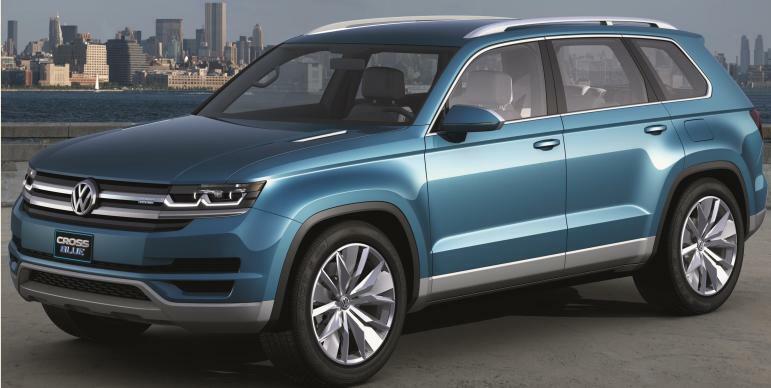 If it goes into production, the CrossBlue, a seven-seat midsize crossover, would slot in above the Tiguan and below the premium Touareg. The all-new Mercedes-Benz 2014 CLA-Class four-door coupe has Mercedes-Benz’s 208 horsepower 2.0-liter four cylinder gasoline engine mated to a 7-speed Dual Clutch Transmission with the ECO stop/start function. The CLA250 and CLA250 4MATIC both include the 5.8-inch display and Bluetooth as standard equipment. The all-new 2014 CLA250 arrives in U.S. dealerships this Fall and the 2014 CLA250 4MATIC all-wheel drive in the Spring of 2014. The all-new Honda "Urban SUV Concept" vehicle featuring fuel-efficient Earth Dreams™ Technology and be priced and positioned below the CR-V and is slated to launch in Japan by the end of 2013, followed by the U.S. market in 2014. Part of Honda's Global Compact Series, and utilizing the Honda-original center-tank layout featured on the Fit, the model will include Honda's configurable Magic Seat® setup that can provide a host of passenger and cargo options, including a fold-flat mode for maximum cargo capacity. The all-new model will also feature next-generation telematics and a modern interior. The 2014 Acura MDX Prototype is the direction for the third generation of the 7-passenger Acura MDX performance luxury SUV, 1.5-inches lower than the outgoing model, and launching by mid-year in both all-wheel-drive and front-wheel-drive layouts. 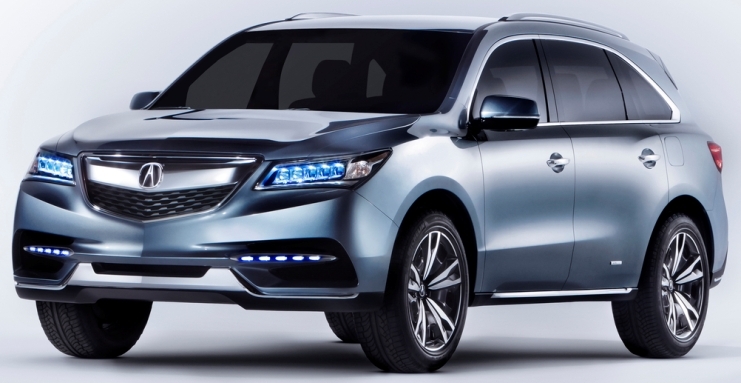 The 2014 MDX will also feature an all-new, more rigid and lightweight chassis and an all-new, direct-injected 3.5-liter i-VTEC SOHC V-6 engine with Variable Cylinder Management. 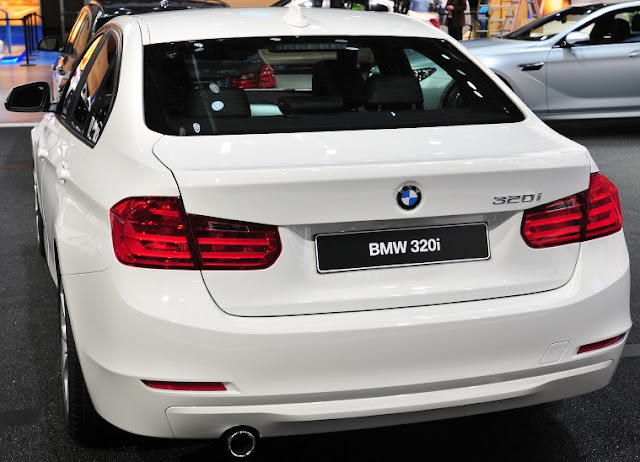 The new 2013 BMW 320i Sedan for the US market with a 180-horsepower 2.0-liter TwinPower Turbo 4-cylinder engine goes on sale in late-Spring priced from $33,445 (including $895 Destination & Handling). The BMW 320i xDrive Sedan featuring BMW’s intelligent all-wheel drive system will also be available from $35,445 (including $895 Destination & Handling). Preliminary fuel economy estimates for the 320i with 6-speed manual transmission are 22 City / 34 Highway, while 23 City / 33 Highway are estimated for the 320i equipped with 8-speed automatic. The 320i xDrive model is expected to achieve 22 City / 33 Highway. The broad palette of standard equipment includes Bluetooth smartphone integration and BMW’s Auto Start-Stop function. It's lowered the entry into a new 3 Series sedan by more than $3,000. 2014 Jeep® Grand Cherokee has a new 240 horsepower 3.0-liter EcoDiesel V-6 engine mated to a new eight-speed transmission delivering 30 miles per gallon with a driving range of more than 730 miles and a towing capability of 7,400 pounds. Other engine options are the 290 horsepower 3.6-liter Pentastar V-6 engine achieving up to 25 mpg highway and more than 600-miles driving range and the 360 horsepower 5.7-liter V-8 getting up to 21 mpg highway. The 2014 Jeep Grand Cherokee is available in Laredo, Limited, Overland and Summit models. A new Eco Mode optimizes the transmission’s shift schedule and, in V-8 models, Fuel Saver cylinder deactivation. The Eco Mode also activates Grand Cherokee’s air suspension system, lowering it to “Aero Ride Height” when the vehicle speed remains between 52 mph and 56 mph, or exceeds 56 mph. The new 2014 Jeep Grand Cherokee features three available 4x4 systems (Quadra-Trac I, Quadra-Trac II and Quadra-Drive II), an available Quadra-Lift air suspension and a Selec-Terrain traction management system which offers five different driving conditions: Sand, Mud, Auto, Snow, Rock. The 2014 Jeep Compass features a standard 158 horsepower 2.0-liter World Gas Engine for the Sport and Latitude models coupled with the standard five-speed manual transmission or the available new PowerTech six-speed automatic transmission, and delivers fuel economy of up to 30 mpg on the highway when mated to the five-speed manual transmission. The 172 horsepower 2.4-liter I-4 World Engine with dual variable-valve timing (VVT) on both intake and exhaust camshafts, is available on all models and standard on the Limited. The Jeep Compass’ 2.4-liter four-cylinder engine paired with a five-speed manual transaxle in front-wheel drive configuration delivers 23 mpg in the city and 28 mpg on the highway. The 2014 Jeep Compass is available in three configurations: Sport, Latitude and Limited. All are available with front-wheel drive, the Freedom Drive I full-time active 4x4 system, or the Freedom Drive II Off-road full-time active 4x4 system with low-range capability. The 2014 Jeep Compass provides up to 2,000 pounds of towing capacity and all models will begin arriving in dealer showrooms in the second quarter. The all-new 2014 Infiniti Q50 luxury sports sedan takes its styling cues from the Infiniti Essence concept, and has a choice of a 328 horsepower 3.7-liter V6 engine or new Q50 Hybrid featuring Infiniti's Direct Response Hybrid System™ with Intelligent Dual Clutch Control. Both powertrains will be offered with rear-wheel drive or Intelligent All-Wheel Drive. The all-new 2014 Infiniti Q50 goes on sale at Infiniti retailers in the United States and Canada this Summer. The Cadillac ATS took the 2013 North American Car of the Year. The jurors gave the ATS 207 points, the Accord 159 points and the Fusion 124 points. 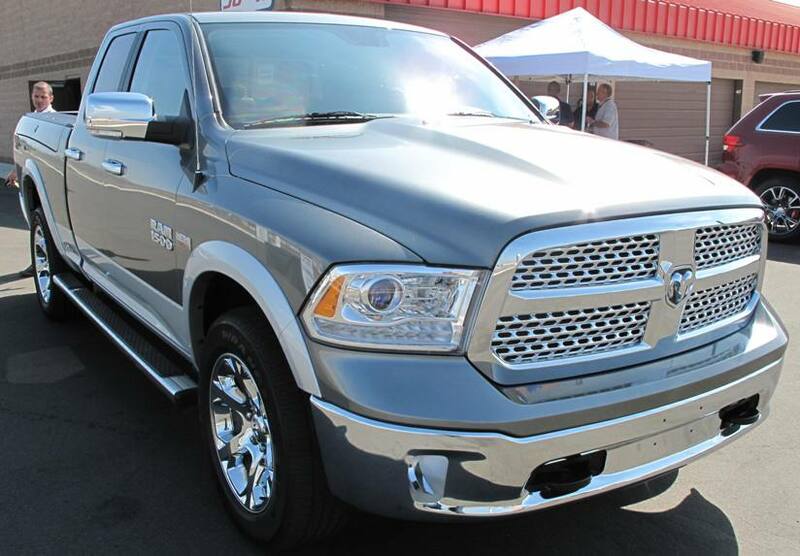 The Ram 1500 won the 2013 North American Truck/Utility of the Year. The jurors gave the Ram 1500 261 points, the CX-5 142 points and the C-Max 87 points. Get the tour of the Ram 1500. The awards, now in their 20th year, were chosen by a jury of 49 automotive journalists from the United States and Canada. 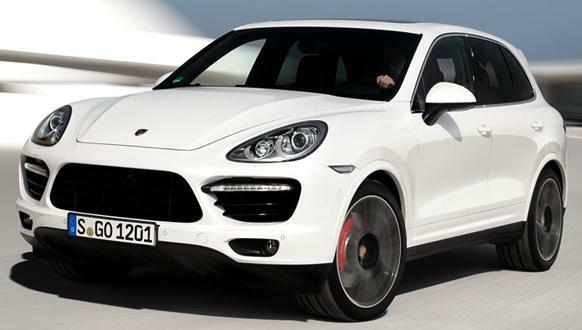 Porsche Cayenne Turbo S with a 550 horsepower 4.8-liter twin-turbocharged engine that accelerates from zero to 60 in 4.3 seconds and a top track speed of 175 mph is scheduled to arrive in dealerships in the Spring at a starting price of $146,975 (including a $975 destination charge). The Lincoln MKC Concept small luxury utility vehicle makes its debut in Detroit. 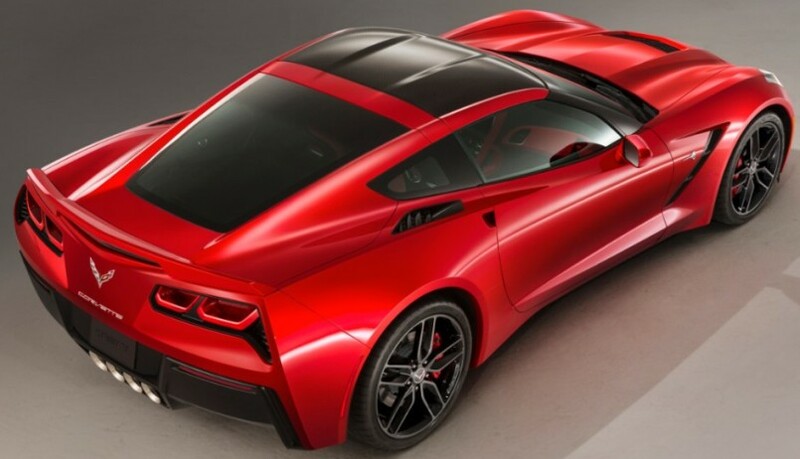 The all-new 2014 Chevrolet Corvette Stingray with an estimated 450 horsepower from an all-new 6.2L LT1 V-8 engine is able to accelerate from 0-60 in less than four seconds and will exceed the EPA-estimated 26 mpg of the current model when it goes on sale in the third quarter of this year. America's finest sports car? Could be. Lightweight materials include a carbon fiber hood and removable roof panel, composite fenders, doors and rear quarter panels, carbon-nano composite underbody panels and a new aluminum frame help shift weight rearward for an optimal 50/50 weight balance. The Z51 Performance Package includes an electronic limited-slip differential, dry-sump oiling system, integral brake, differential and transmission cooling, as well as an aero package that further improves high-speed stability. This looks like the best answer to mid-life crisis and the ultimate retirement self-reward.